Sometimes I think I'm plenty gloomy about housing. Then I read more bad news I hadn't considered. Today's Wall Street Journal has an article about condos (subscription required) that adds more gloom to the housing picture. Condos may take a year or two to build. At the beginning, the developer signs sales contracts with buyers, then starts building. Now that the buildings are complete or nearly complete, the buyers are either backing out because they perceive the condos as overpriced in today's market, or the buyers cannot get financing because the appraisals are coming in too low. So the developer doesn't get his money from the buyers, and the developer's bank doesn't get repaid on the construction loan. This is also happening with condo conversions, where a company bought an apartment building with the idea of spiffing it up and selling individual units. The single family home sales information that I discussed recently does not include condos, so this is an additional problem. Many of the condo units will either be sold at low prices, or be converted into rental units. They add to the excess supply on the market. Keep in mind that with these long-lead-time projects, new supply keeps coming onto the market even after the market has weakened. Back when these projects were started, the market didn't look so weak. 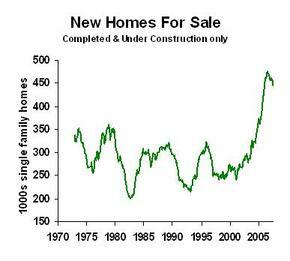 Business planning implication: this is just another reason for no optimism about the housing market. I had been concerned that business confidence could fade. With housing in the absolute tank, we can't handle any other problems now without being either in recession, or close to it. 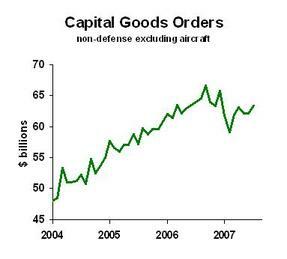 But the upturn in durable goods orders is comforting. The risk of recession is not zero by any means, but neither is it terribly high right now. 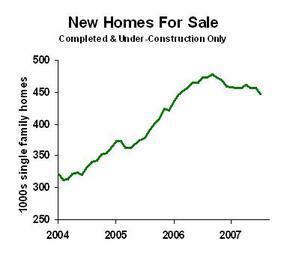 When will new housing inventory get back down to normal? Let's say that the normal range has an upper limit of 350,000 homes. Since the peak inventory in September of last year, the inventory has been dropping by 3,000 homes a month. We get from the current inventory back down to 350,000 by the spring of 2010! 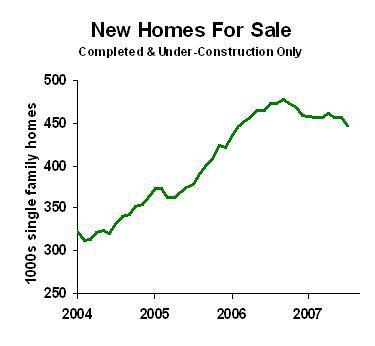 We have excess housing inventory until 2010 unless new construction is cut back even more, or some magical new buyers appear. I think the best chance for homebuilders is mass migration to earth from the planet Zorg. Anything else is pretty speculative. Most of this blog is directed to business leaders, but with all this talk about preparing for recession, it's time for some family financial planning. First step is to evaluate your economic risk. For those of you with jobs, look at the history of layoffs in your sector. If you're a construction worker or a factory worker making industrial equipment, you probably know that your sectors usually run through boom-bust cycles. Your risk is high. If your job is in health care or retail trade, your risk is much, much lower. It's always possible that your employer will go out of business or cut back on staff, but you should be able to pick up another job fairly easily. If you own a small business, then think like a business leader and look at some of the past blog posts on the subject, such as this one. If you are living on a fixed income, be happy. Fixed incomes are . . . fixed. No worries about a recession. In fact, a recession is a buying opportunity. If you are living on investment income, try to divorce your thinking from day-to-day fluctuations. Think long and hard about asset allocation. The second step is to monitor conditions relative to your economic risk. So if you are a construction worker, for example, follow the news about construction activity in your type of project (residential, commercial, roads, etc.) Don't be caught by surprise. The third step is to sketch out a contingency plan. Let's take the job loss scenario. What are the bills that must be paid each month? How much cash do you have in savings? Divide savings by monthly must-pay and you have the number of months you can get by. If this is a small number--less than six--then sketch out what expenses can be cut if need be. Make sure that you have credit in place for emergencies, such as replacing a car's transmission. You may not be able to raise your credit limits if you have been laid off, so ask about a higher credit limit now. Also think about temporary job opportunities. If you have little savings, what might you do to bring in some money while you look for work? If you're a computer programmer, there's nothing wrong with delivering pizzas in the evening while job hunting in the day. The biggest advantage of the contingency planning is that it forces you to think through your budget. Even if you don't follow your contingency plan in all of its details, having thought about it will help you be prepared. Finally, maintain your financial flexibility. That means limiting your commitments. You have more flexibility if you spend your cash on a used car rather than committing to monthly payments on a new car. If your cell phone contract is up and your phone is working fine, keep it. Sure, you can get a new phone after two years, but only by locking yourself in to another two year contract. Stay on the month-to-month plan with an old phone if you are at high risk. Think about these long-term commitments with cable as well. If a recession comes, I expect it to be pretty mild. Also worth noting: unemployment rates are much lower for more educated people. (The Bureau of Labor Statistics has a simple table on the subject.) Good luck. "Many on Wall Street are more pessimistic, and believe the Fed will still have to cut interest rates sharply . . ."
Here's Wall Street's problem (which many of my friends here on the West Coast also have). Wall Street does not understand that Wall Street is not Main Street. From the perspective of a stock market investor, things look bad and the Fed should cut. But from the perspective of a business owner or executive, things are not so bad. Customers are still spending (outside of new home construction). Business goes on decently. Main Street does not need more stimulus at this point. But Main Street has no pundits going on CNBC talking about what the Fed should be doing. The good news, however, is that the Fed has ears on Main Street. Every Federal Reserve Bank, and every branch of every Federal Reserve Bank, has a board of directors. Each board member reports monthly on his or her area of the economy, and many of them also watch a related part of the economy. They don't track the economic statistics--the Fed's staff does that--but these directors talk to their corporate contacts about how business is going. Those anecdotes are funneled up to the Fed, culminating in the Beige Book. The Fed won't ease unless it hears that Main Street is not able to get the credit that it's used to. Right now, the Fed is not getting that word, based on the conversations I'm having with my clients and contacts. Bottom line: don't look for a rate cut, and don't pay too much attention to Wall Street. The recent financial crisis highlights the need to prepare for recession. Now, I'm NOT forecasting a recession. 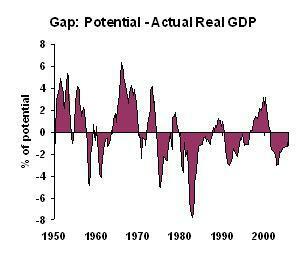 But the risk is there, and we economists are not real good at predicting just when a recession will occur. Mark Thoma, in my interview with him, suggested thinking in terms of a recession story. That is, what's the chain of events that would lead to recession. That story changes from time to time. Earlier this year, the riskiest story had consumers cutting back sharply on their spending because of the housing price decline. Today's riskiest story is a bit different: the subprime crisis leads to excessive caution in other markets, preventing credit-worthy companies and individuals from getting loans. I don't think that's going to happen, but if a little bird whispered in my ear that we were headed into recession, this would be the most likely explanation. So what do you do with the story? First, see where you stand in the story line. If you don't rely on credit in your business, the impact on you will be through the general economic recession. This is garden variety stuff; it's what my book is all about. Part of your contingency planning should involve the most likely path to recession, as well as the four steps every business should take to anticipate a downturn. Risk in Financial Markets: Going Up? 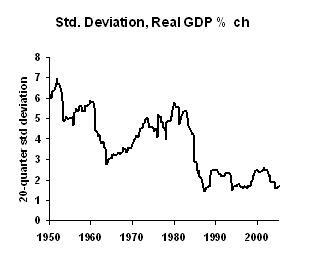 Jim Hamilton over at Econbrowser has an interesting post entitled Where's the Risk? He looked at bond yield spreads and didn't see any higher risk. 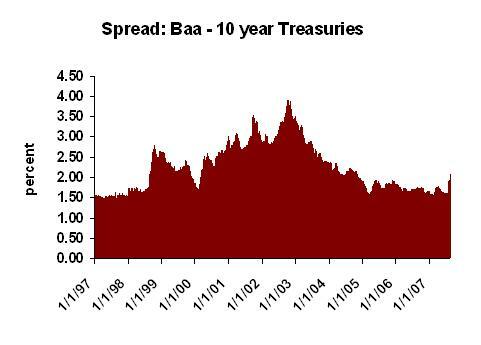 The widely-used Fed database of interest rates doesn't include less-than-investment-grade issues, which is the first place I'd look for widening spreads. Maybe one of you with a Bloomberg handy will show us some spreads. This is good news: It suggests that the subprime crisis is not spilling over to other markets. The risk of recession is not that the subprime mortgage market dries up; we can live without it. The risk is that fundamentally sound borrowers will not have access to credit. 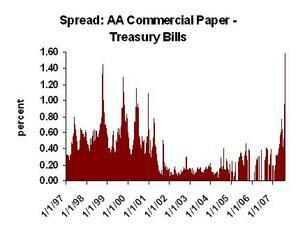 Although we could live with that in the long run, in the short run, a sudden drying up of credit is recessionary. My best estimate: we skirt through this crisis without widespread repercussions. But anyone who is absolutely sure what the future holds is a moron. 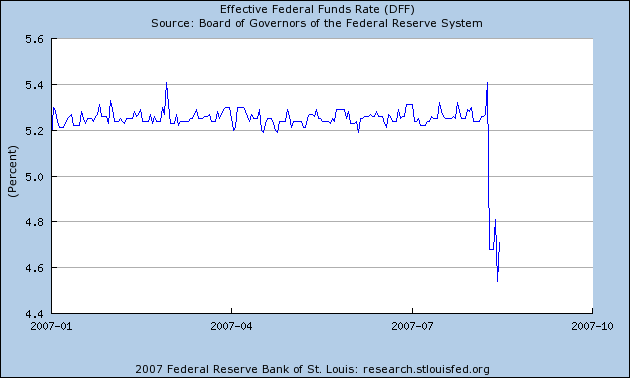 Has The Fed Muffed It? The 2001 recession shows up as a relative mild experience, and we are approaching full output. By all of these measures, the Fed has done a decent job in the past decade. Certainly not perfect, but not nearly as bad as in the "good old days." So, my friends, keep on ranting, but remember that the Fed is doing a much better job now than in the past. If they are making mistakes, they aren't real bonehead mistakes. They are dealing with a challenging environment. 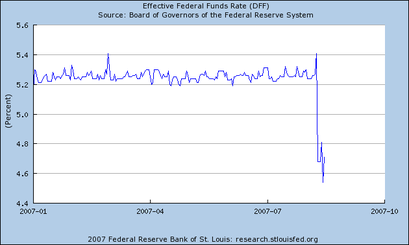 Wow, that looks like an easing to me. The lack of an announcement by the Fed suggests that they view this a temporary. They don't want to announce an easing today, then a rate hike next week. Fair enough. But it sure looks like an easing of monetary policy to me. The Fed cut the discount rate today. If you're just getting around to hearing the news, the announcement is here. 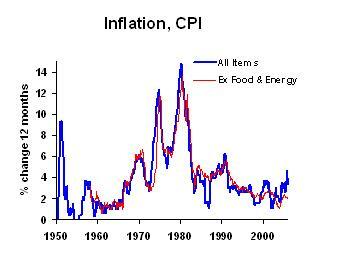 This is NOT an easing of monetary policy. This is a provision of liquidity. I expect that the Fed followed the pattern of the Penn Central Crisis. (Read "Adam Smith's" account of this in The Money Game; it's hilarious and accurate both.) When the Penn Central railroad declared bankruptcy, the commercial paper market panicked. Federal Reserve officers got on the telephone to all of the country's top bank executives and said, "If someone who might be credit worthy walks past your bank, lend them some money." The Fed's goal today is to ensure that credit-worthy enterprises get credit. It's not a bail-out move, or a general easing, but an action targeted at stopping a contagion, in which the subprime market's problems spread over to the healthy side of the economy. Think of the subprime house as having a big "Quarantine" sign on it.